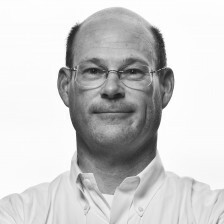 I’ve gotten a couple questions recently from athlete friends about using aspirin to help prevent heart disease. 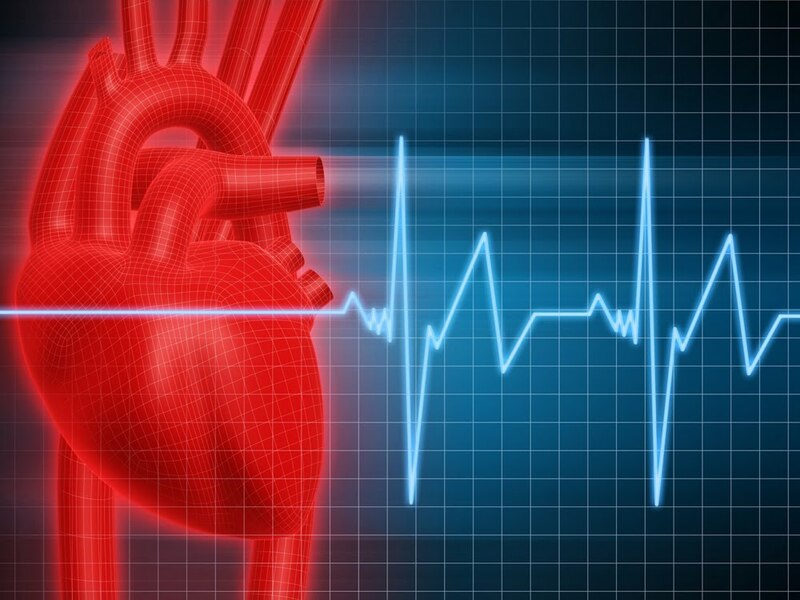 Just before I started the Athletes Heart Blog, I had some discussion with my triathlon friends about this issue, and I thought I’d share my thoughts with a broader audience here. Later this week, in a separate blog post, I’ll talk about aspirin specifically. But first….we need to talk about your risk of developing coronary heart disease (CHD). And by this, I mean the collection of clinical problems caused by coronary artery disease (CAD)—sudden death, heart attack, angina—that I discussed in a previous blog post. It’s important to know YOUR personal risk for the development of CHD because the effectiveness of drugs (or other treatments) in PREVENTING you from developing CHD depend very much on your inherent RISK. Over many decades, data have been collected by the Framingham study on a very large number of Americans about their health and lifestyle habits. 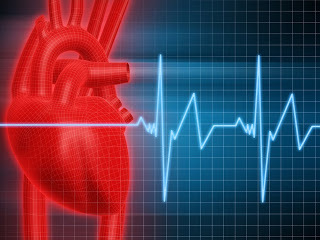 One byproduct from this large database has been the development of equations that can be used to predict your 10-year risk of developing CHD. 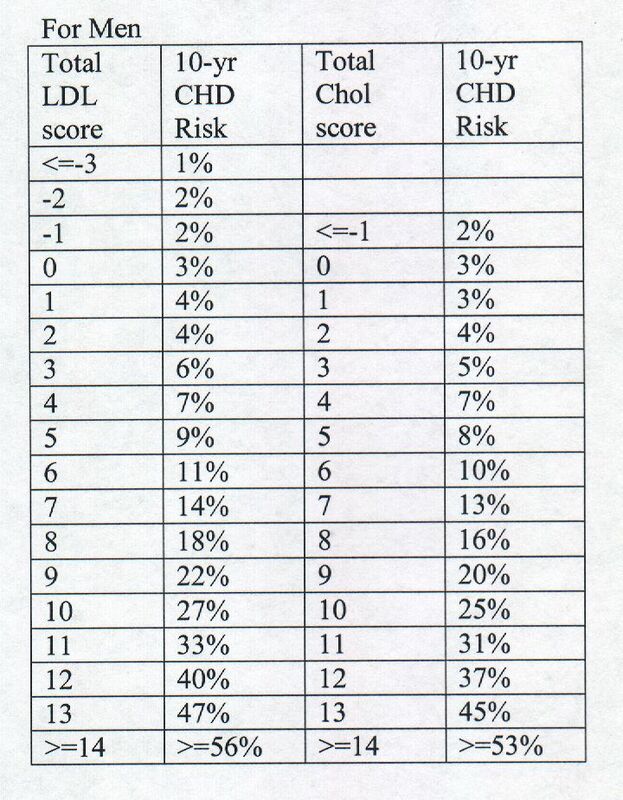 Use the “worksheets” below to tally up points for your LDL score and your Chol score. 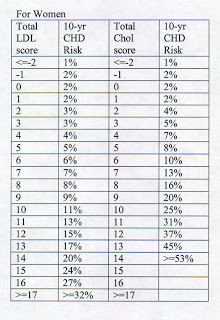 When you’ve tallied up the points, you’ll use the appropriate table to determine your 10-year risk of CHD. We need to consider men and women separately because the risks are different….and so there are separate “worksheets” and tables for men and women. 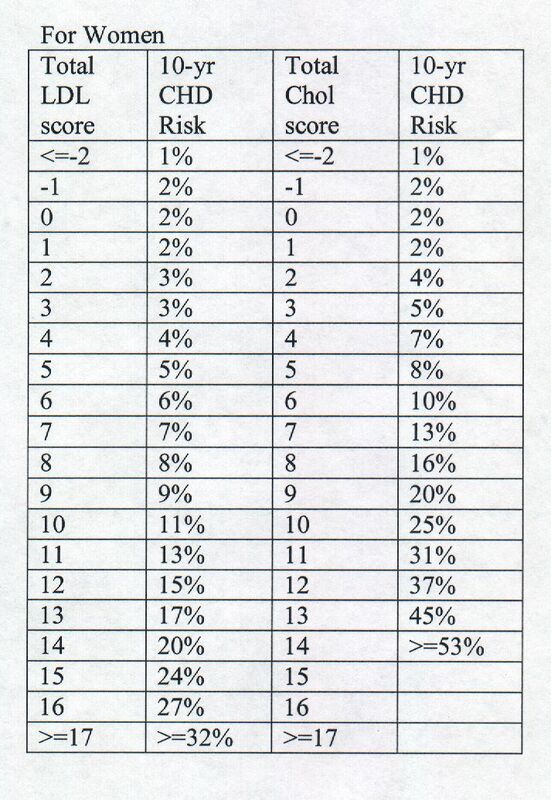 Now you’ll know YOUR risk. This is an important number and you should talk about this with your doctor when you visit. Next time, we’ll talk about whether aspirin can reduce your risk of CHD. And we’ll be able to talk about other prevention strategies as well. Check back later this week. 30-34: LDL score = -1; Chol score = -1. 35-39: LDL score = 0; Chol score = 0. 40-44: LDL score = 1; Chol score = 1. 45-49: LDL score = 2; Chol score = 2. 50-54: LDL score = 3; Chol score = 3. 55-59: LDL score = 4; Chol score = 4. 60-64: LDL score = 5; Chol score = 5. 65-69: LDL score = 6; Chol score = 6. 70-74: LDL score = 7; Chol score = 7. 100-159: LDL score = 0. 160-190: LDL score = 1. >=190: LDL score = 2. 160-199: Chol score = 0. 200-239: Chol score = 1. 240-279: Chol score = 2. >=280: Chol score = 3. 35-44: LDL score = 1; Chol score = 1. 45-54: LDL score = 0; Chol score = 0. >=55: LDL score = -1; Chol score = -2. 120-129: LDL score = 0; Chol score = 0. 130-139: LDL score = 1; Chol score = 1. 140-159: LDL score = 2; Chol score = 2. >=160: LDL score = 3; Chol score = 3. 80-84: LDL score = 0; Chol score = 0. 85-89: LDL score = 1; Chol score = 1. 90-99: LDL score = 2; Chol score = 2. 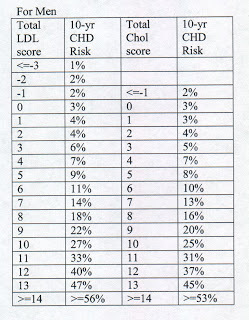 >=100: LDL score = 3; Chol score = 3. No: LDL score = 0; Chol score = 0. Yes: LDL score = 2; Chol score = 2. 30-34: LDL score = -9; Chol score = -9. 35-39: LDL score = -4; Chol score = -4. 40-44: LDL score = 0; Chol score = 0. 45-49: LDL score = 3; Chol score = 3. 50-54: LDL score = 6; Chol score = 6. 55-59: LDL score = 7; Chol score = 7. 60-64: LDL score = 8; Chol score = 8. 65-69: LDL score = 8; Chol score = 8. 70-74: LDL score = 8; Chol score = 8. 160-190: LDL score = 2. 240-279: Chol score = 1. 35-44: LDL score = 2; Chol score = 2. 45-49: LDL score = 1; Chol score = 1. >=55: LDL score = -2; Chol score = -3. 130-139: LDL score = 0; Chol score = 0. 85-89: LDL score = 0; Chol score = 0. Yes: LDL score = 4; Chol score = 4. Thanks for stopping by, Alena.